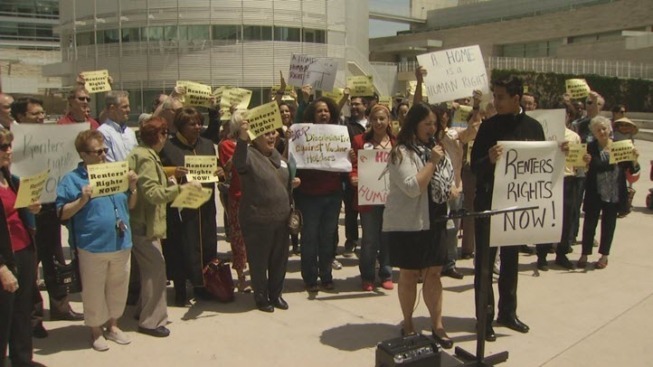 Several residents along with rent control advocates on Wednesday demanded the city implement immediate and stricter rent control in San Jose. The group flooded the city council's rules committee meeting, which was addressing the issue. The large crowd prompted the meeting to be moved to the council chambers. "We need to do something now," Councilman Raul Peralez said. "We have a crisis now." Rent control advocates want to drop the 8 percent limit rent increase to 4 percent. In addition, they are asking for a just cause eviction ordinance and to eliminate discrimination based on income. Some council members said they are not ready to make any decision on the issue without studying it first. "We have to know what we can do legally," Vice Mayor Rose Herrera said. "I'm not an expert in this. We need to hear from legal counsel." A Forbes study shows the average rent in San Jose for a two-bedroom apartment is nearly $2,300, with the vacancy rate at 3.5 percent. Thousands of new apartments are being built around the city, but even the boom is not keeping up with the demand. And if the demand was met, many said the new units will be well out of their price range. Even some techies who are making good wages said they need some sort of rent relief in the Silicon Valley. "Your disposable income gets shorter and shorter," said Mansi Kansal, a tech worker in the Silicon Valley. "And now we're seriously considering buying." The rules committee's next step is to make a recommendation to the city council.